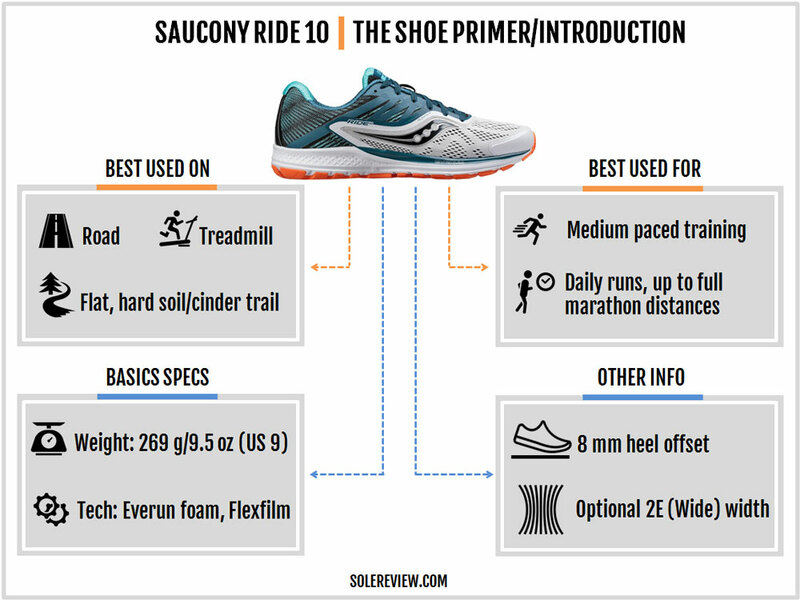 Saucony’s marketing pitch: The Ride 10 brings plenty of new innovation while still delivering a legendary running experience. Upper: Engineered and regular mesh, fused synthetic. 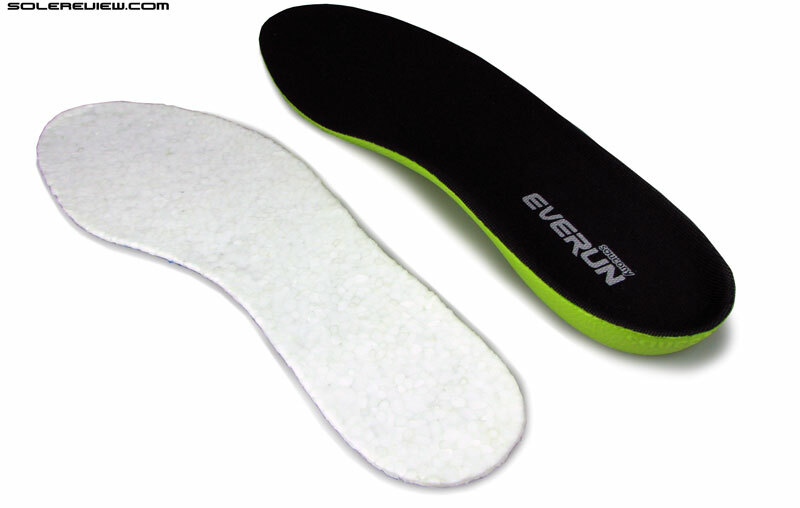 Midsole: Everun Topsole over an injection molded midsole. 8 mm heel to toe gradient. The Ride 10 is a simple yet versatile shoe. An EVA foam midsole and Everun Topsole provides a straightforward cushioning experience suitable for a variety of runs, and the new upper increases forefoot room by using more mesh and less synthetic. As is the order of things, the Saucony Guide (the support version of the Ride) got its annual refresh before the Ride. The Guide 10 ditched the external SRC crash pad for a simpler midsole design, and the Ride 10 follows suit. 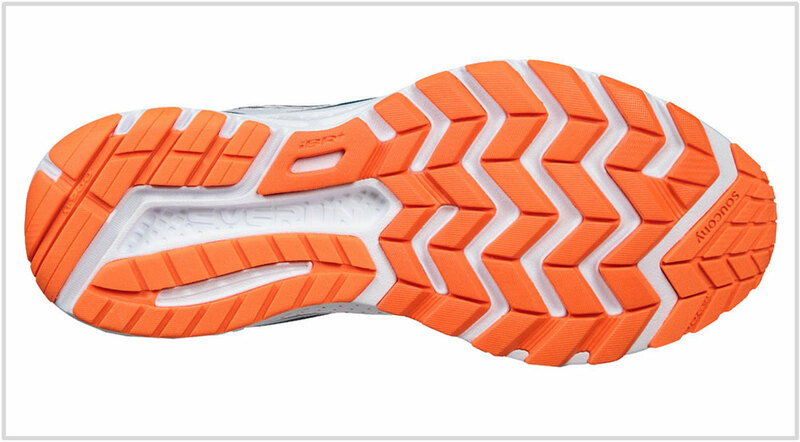 Much like the Guide 10, the Ride 10 is now built on a single-density EVA foam midsole. 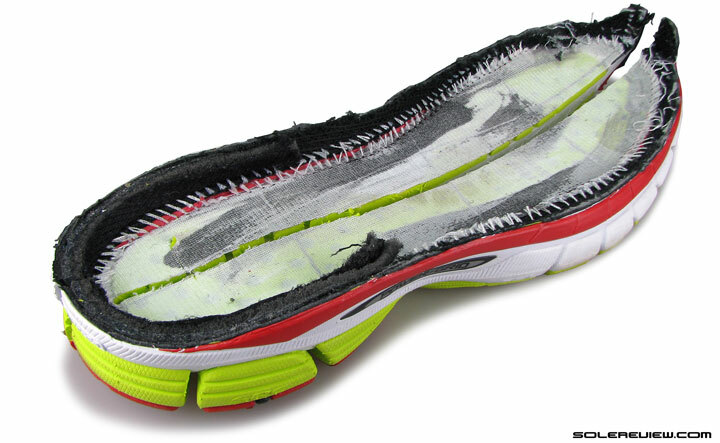 Inside, there’s an Everun topsole and a removable sockliner. 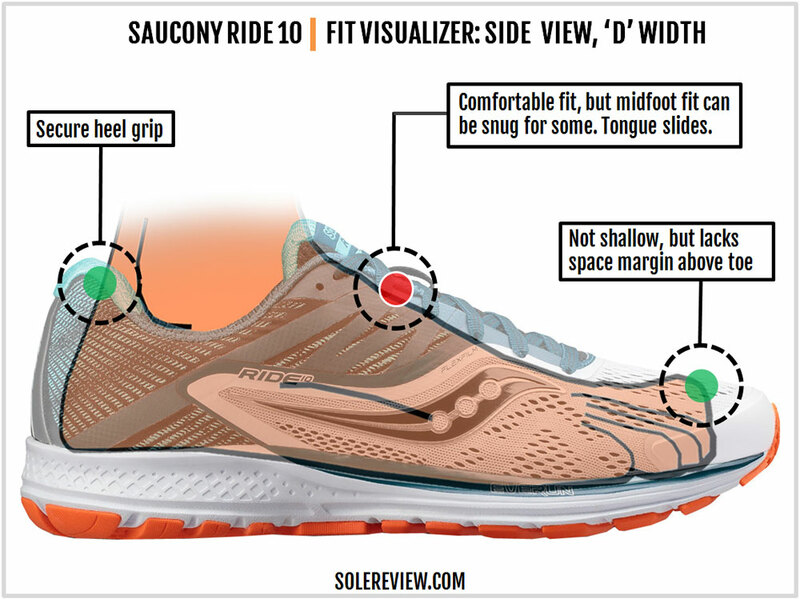 So does this change the Saucony Ride’s positioning, that of a daily cushioned trainer? The Ride remains a comfortable (and relatively lightweight) neutral running shoe, so there’s nothing to worry about. That said, there are some resulting updates in the ride quality due to the redesign. The new Ride gets a brand new upper with external design tweaks, so there’s a difference in the fit quality over the Ride 9. The Ride 10’s upper is a subtle evolution of the previous design. The exterior is a mix of mesh, fused synthetic (aka the Flexfilm) and other cosmetic details. Updates come in the form of the new engineered mesh which is a departure from the regular spacer mesh we saw on the Ride 9. The two-tone engineered mesh uses a combination of vented and closed sections over a single component, hence providing breathability and support wherever needed. This mesh design was first popularized by the Nike Lunarglide 4 over five years ago, and it’s spread throughout the industry since then. There’s Flexfilm over the Ride 10’s upper, but there’s far less of it over the forefoot when compared to the Ride 9. This time around, most of the fused synthetic (Flexfilm) is concentrated over the midfoot. This brings expected changes to the forefoot and midfoot fit character, a topic we’ll cover during the upper fit breakout. You’ll recognize plenty of familiar features from the Ride 9. The toe-bumper is molded over the front as it was last year, except that it is slightly shorter. The heel has an internal molded counter, and the collar lining is made out of two separate pieces of Saucony’s ‘Rundry’ textile. Other bits and pieces are carried over from the previous model. To be more specific, the tongue lining, the flat and semi-elastic laces, the reflective lace-loop, and the molded midfoot logos are nearly identical to the Ride 9. Saucony calls out the ‘woven heel piece’ on the Ride 10, but that’s just a cosmetic treatment. The heel support comes from the internal counter which has been used on the Ride as long as we can remember. What’s changed though, is the height and molding of the heel. The Ride 10’s heel is molded wider than the Ride 9 but compensates for this update with an increase in back height. The highlight of the Ride 10’s new midsole is the elimination of the SRC Crash pad. The crash pad was originally designed to serve as a softer landing zone under the rearfoot, and for a long time, it was seen on most Saucony models. 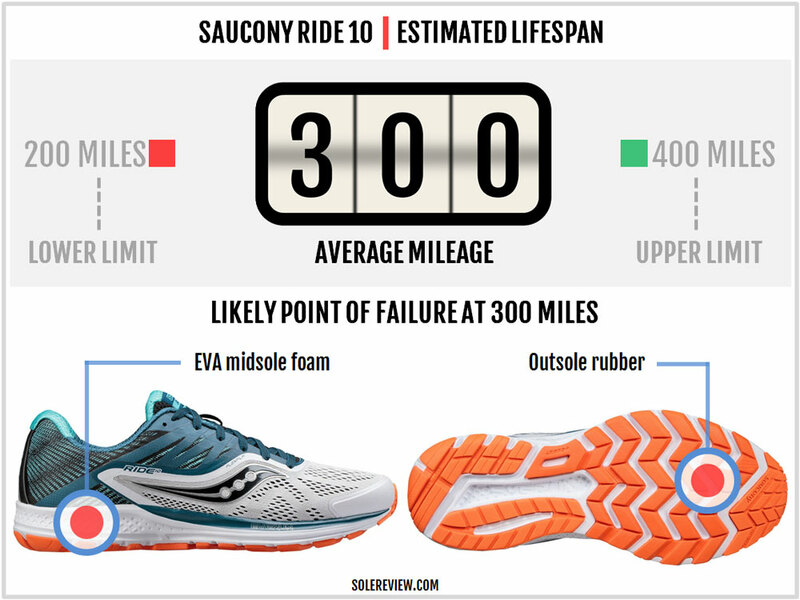 Today, only a small percentage of Saucony models have an external crash pad. Instead, the Ride 10 now uses a single piece and single density EVA midsole. There’s no separate crash pad on the side, and what you get is an injection-molded EVA foam midsole (also known as the Saucony Powerfoam) with a couple of layers over it. It is worth noting that the Ride 9 (and also the V7 and V8) used a compression molded midsole (versus injection molding on the Ride 10), so the ride quality is affected by this update. Inside the shoe is a combination of the removable EVA foam insole and an Everun ‘topsole’ stacked over the primary midsole. The topsole is a thin slice of Saucony Everun (expanded TPU foam) intended to serve as an additional layer of cushioning. Note that this is different from how Everun is used on the Freedom ISO. On the Freedom, the entire midsole is made of Everun instead of just the Topsole. The Topsole is intended to replace the older ‘Powergrid’ foam last seen on the Ride 7 and 8. As a nod to the past, the Ride 10’s midsole has a grid-like pattern molded into its surface. 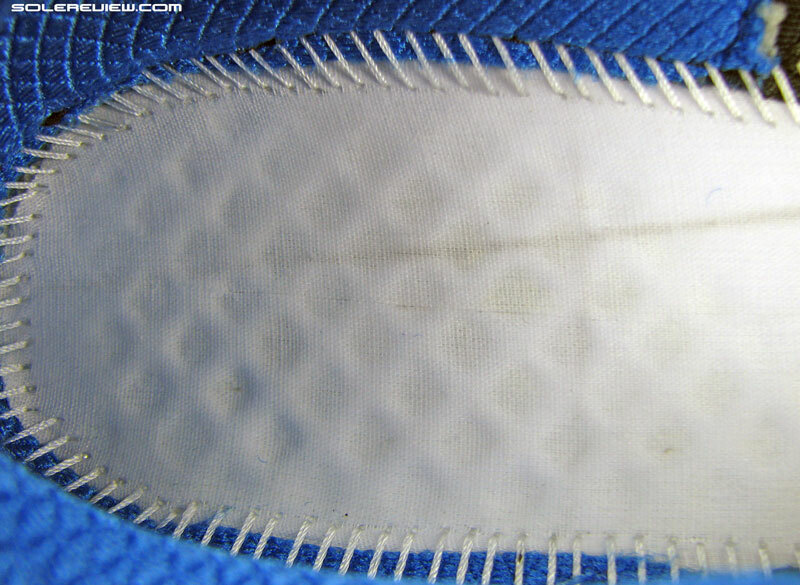 Since the SRC Crash pad is gone, the rearfoot outsole is glued directly to the foam midsole. 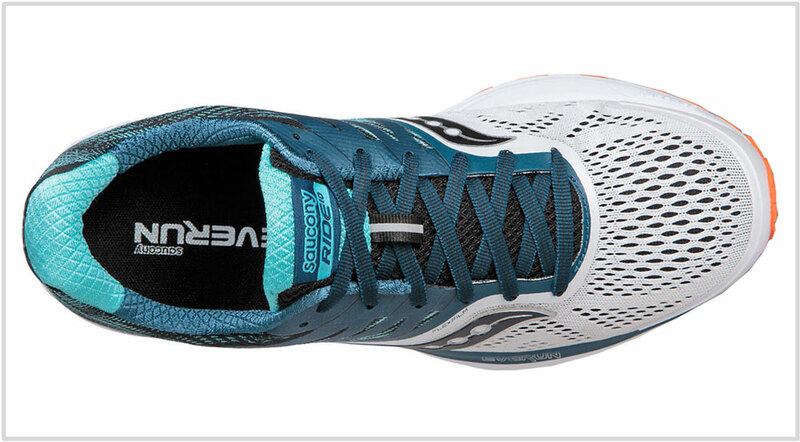 Like most of other Saucony running shoes, there’s an area of exposed midsole foam under the heel. As a general rule, injection molded EVA foam tends to lose their cushioning properties sooner than compression molded ones. By that yardstick, we’ve assumed a lower mileage range for the Ride 10 than the 9 which used a compression molded midsole. Otherwise, the entire shoe has a solid build, using a strong upper along with plenty of outsole rubber to counter wear and tear. Reducing the Flexfilm layering over the forefoot leads to gains in interior space, but mind you, this is relative. 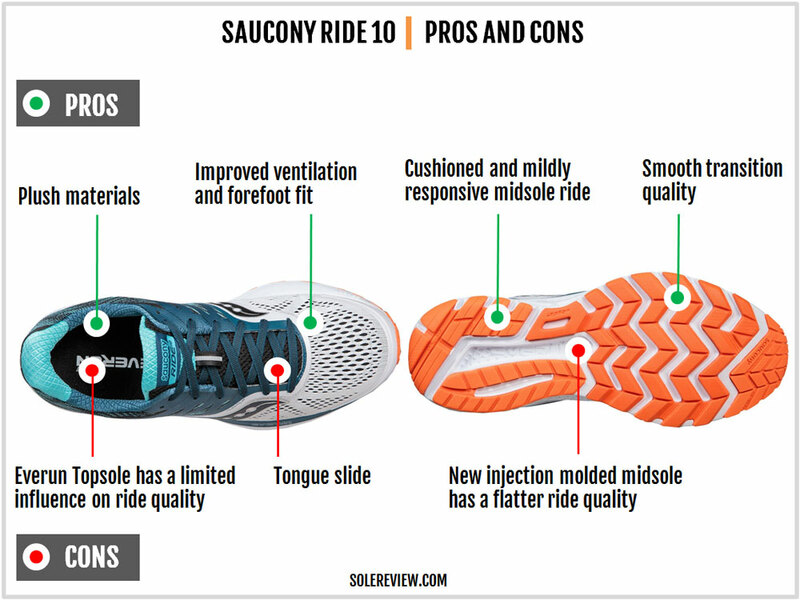 Both the Saucony Ride and Guide have historically had a narrow and somewhat shallow fit, and all that the Ride 10 does is to ease up things a bit. There’s slightly more forefoot room than the Ride 9 and better ventilation, all due to the mostly mesh forefoot. But as all the Flexfilm is concentrated over the midfoot, the fit is snug – especially over the inner (arch) side. The toe-box height is just right, with little margin above the toes. The Ride 10 runs true to size. The heel fit is a bit of a mix. On the one hand, the higher heel height puts more material to hold the foot. On the other hand, the heel appears to have a wider splay (molding) which eases the grip by a degree or two. Both these factors counterbalance one another, so there’s no noticeable fit difference between the Ride 10 and 9. Though the tongue sits plush over the foot thanks to the soft lining fabric and the foam padding, there’s no sleeve attaching it to the main upper. So like the Ride versions before, the tongue tends to slide to one side during runs. 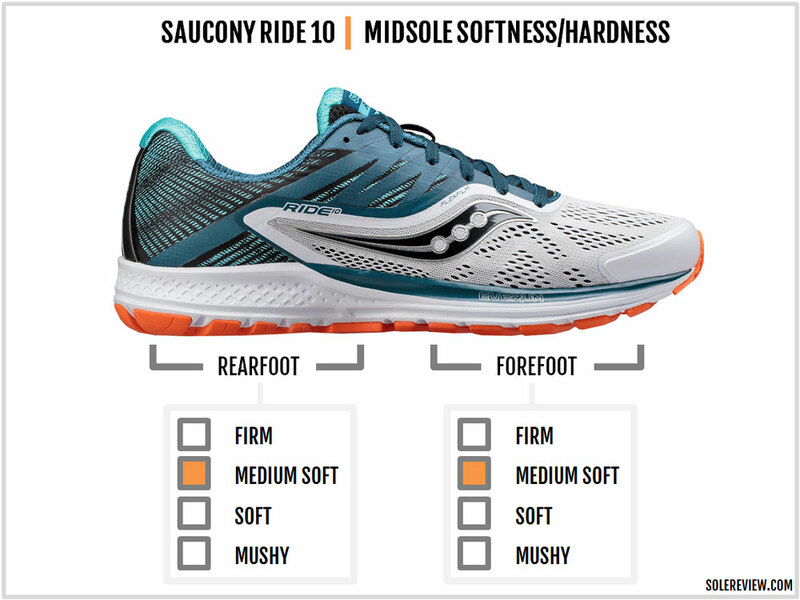 The Saucony Ride has always had a consistent cushioning quality, thanks to its uniform spread of heel-to-toe cushioning materials. 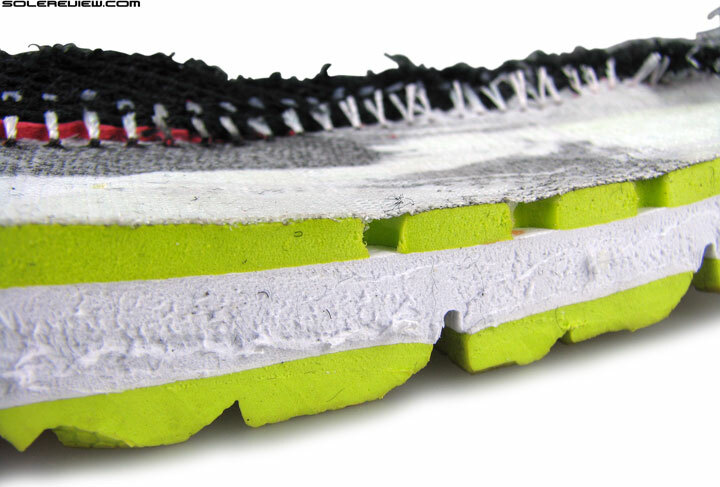 Even the older Powergrid foam (used on the Ride 7, 8) was in the form of a full-length insert, as opposed to the heel-only treatment of some running shoes. 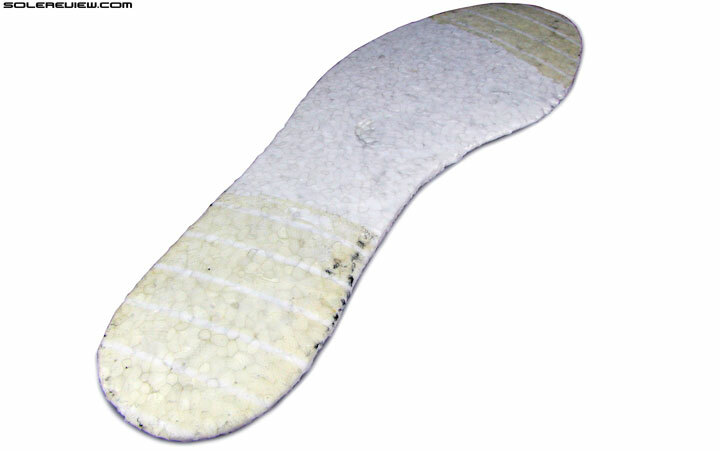 Combine the insole and the topsole with a large volume EVA midsole, and the result is a cushioned ride. Cushioned isn’t the same thing as mushy, and the new midsole is accented with a touch of flatness. That’s due to the removal of the SRC crash pad from under the heel and substituting that with an extension of the foam midsole. As far as responsiveness (springy feel) is concerned, the Ride 10 doesn’t have a whole lot of it. The topsole is just a thin layer of Everun, so it doesn’t have a lot of say in how the shoe rides. The Ride 10 also feels slightly less snappy due to the change in midsole material. The new midsole is 100% injection molded EVA foam, a treatment which ends up feeling less resilient compared to the Ride 9; the latter relied on compression molded parts. Also, the dual-density design of the Ride 7 ~ 9 made the ride quality more sophisticated than the one-dimensional ride quality of the V10. Another way to put the difference in ride quality (versus the Ride 9) is that the Ride 10’s cushioning character feels closer to the Kinvara 8 or the Breakthru 3 than the Ride 9. 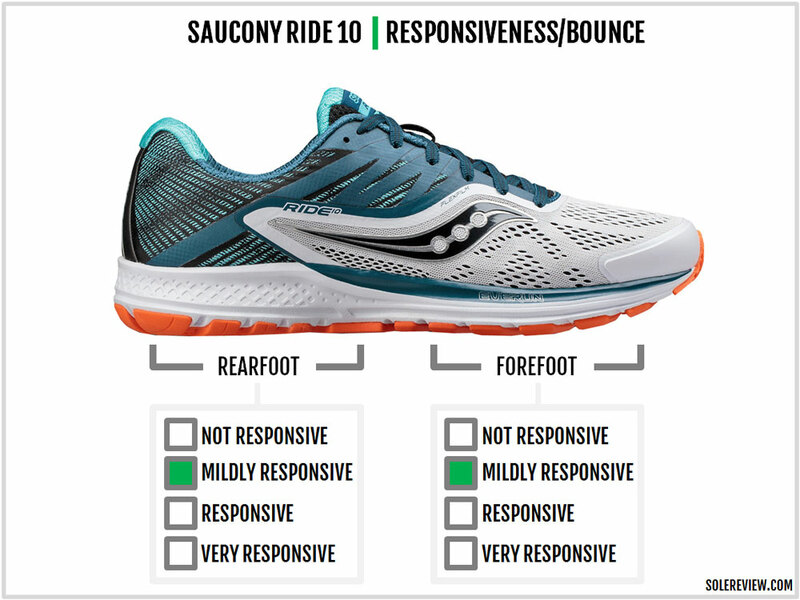 This isn’t surprising, considering that both the Ride 10 and Kinvara 8 use an injection-molded foam midsole with an Everun Topsole. If there’s one area where the Ride 10 does better than the 9, it’s in the area of support. 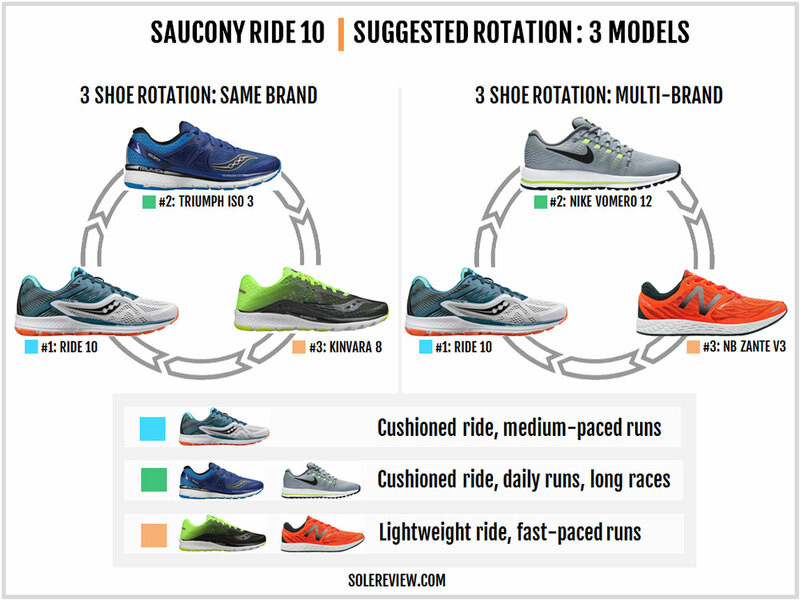 Switching to a single density midsole leads to a more balanced ride. Although the lateral (outer) midsole sidewall has a groove running over it, there’s a lesser degree of compression on that side versus the Ride 9. All that said, these changes do not hinder the Ride 10’s versatile nature. For forefoot strikers, the (softer) blown rubber outsole and three layers of midsole foam prevents jarring landings. The Ride 10’s versatile nature remains untouched, and that’s a good thing. The EVA foam midsole provides cushioning without that sink-in feel, while the Everun topsole provides a touch of rebound. The new upper frees up some much-needed forefoot room, and the Ride 10 uses a plush material package. For all the rubber used on the outsole (which helps durability and grip), the Ride is fairly lightweight for its category – any daily trainer below 10 ounces is. On the flip side, the Ride 10’s topsole is an underwhelming experience. Most of the shoe’s cushioning is delivered by the foam midsole, and partially by the insole and the blown rubber outsole. It’s nice to have an extra layer of Everun in the shape of a Topsole, but don’t read too much into it. Considering that the Ride 10 does not feature the ISOFIT upper seen on the Triumph or the Freedom, tongue slide ends up being a minor annoyance. The tenth version of the Ride is what it has always been – a neutral cushioned daily trainer capable of doing all kind of runs. There are a few changes, but none which hamper the shoe’s versatile character. The changes between the Ride 9 and 10 are packed into a couple of areas. The first is the upper fit quality. The forefoot gets a little more room, the courtesy of using more mesh and less Flexfilm over the forefoot. Conversely, the midfoot fits turns narrower due to the higher use of synthetic. 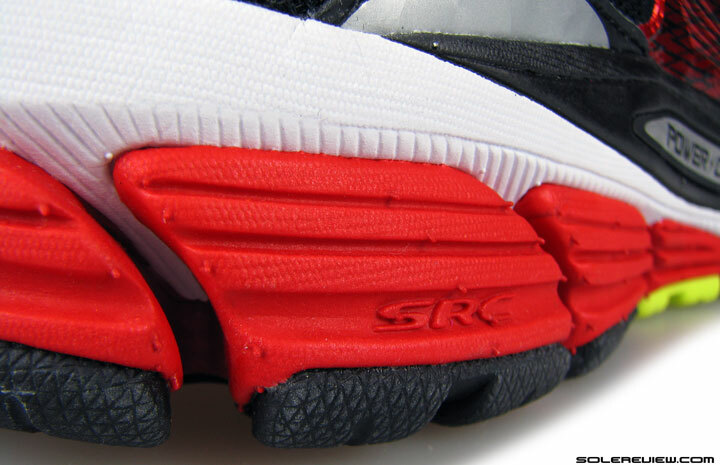 Down below, the midsole transitions to a single-density injection molded kind, leaving the SRC crash pad in the past. As a consequence, the ride gets a bit more supportive. At the same time, the Ride 10 feels ‘flatter’ than the Ride 9 which used a dual-density compression molded midsole. There are other minor updates around the heel or the outsole, but none that majorly affect the fit or ride character. The MSRP remains the same at $120, and so does the weight – save for a mere 0.2 oz gain. The Ride 10 is the middle ground so to speak, so if you need a plusher ride experience, then the Triumph ISO 3 does it for you. The additional Everun insert under the rearfoot gives a higher level of cushioned responsiveness, and the upper packs a wee bit more plushness. You’d want a lighter shoe to go with the Ride 10 for those fast runs. The Kinvara 8 matches the description; its sub 8-ounce weight makes it disappear over the foot, and the sleeved upper securely wraps your foot. 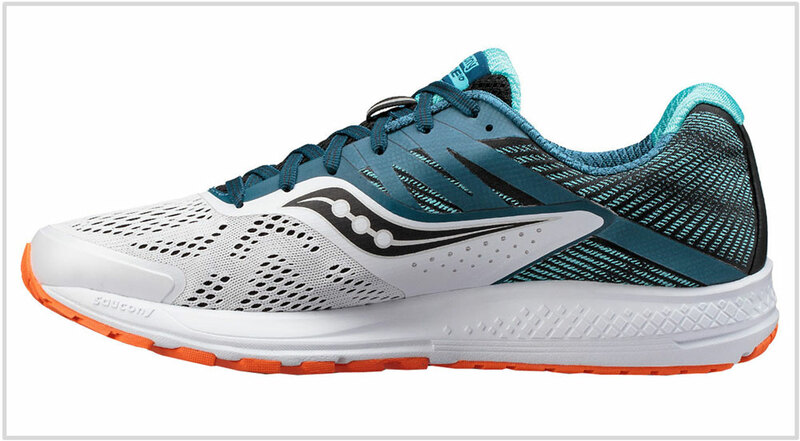 If you have spare cash lying around, then you can also look at the Saucony Freedom ISO instead of the Kinvara. Its midsole is 100% Everun, so the ride quality is in a league of its own. Outside of Saucony, the Nike Vomero 12 performs the role of a long-distance cushioning shoe well, and the New Balance Fresh Foam Zante V3 is great for fast paced runs without sacrificing cushioning. This one’s easy. 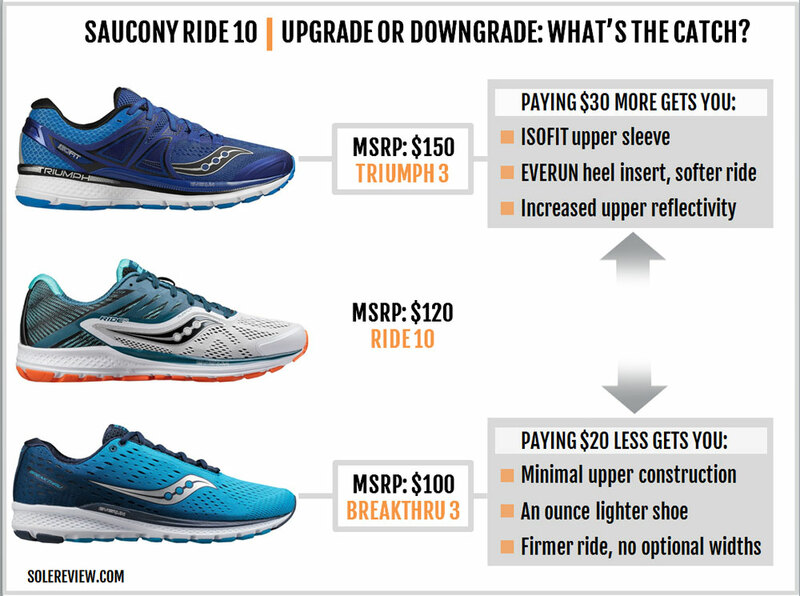 Most of you would be familiar with the pricier Triumph ISO 3, a neutral shoe with more features than the Ride 10. A upcharge of $30 over the Ride 10 gets you a sleeved ISOFIT upper and an additional serving of Everun foam under the heel. 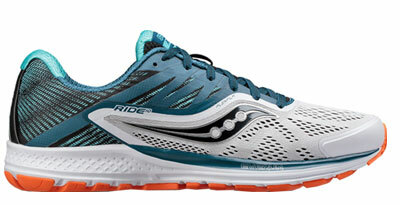 If you’re craving for a lighter shoe with the same heel drop, then consider the Saucony Breakthru 3. The upper fits narrower than the Ride 10, but there’s a lot of common ground. The midsole is single density just like the Ride 10, and there’s an Everun Topsole over it. It’s also worth mentioning that the Breakthru 3 is closer to the Ride 10 than the Breakthru 2 was. The previous Breakthru model had a Powergrid foam insert instead of Everun. 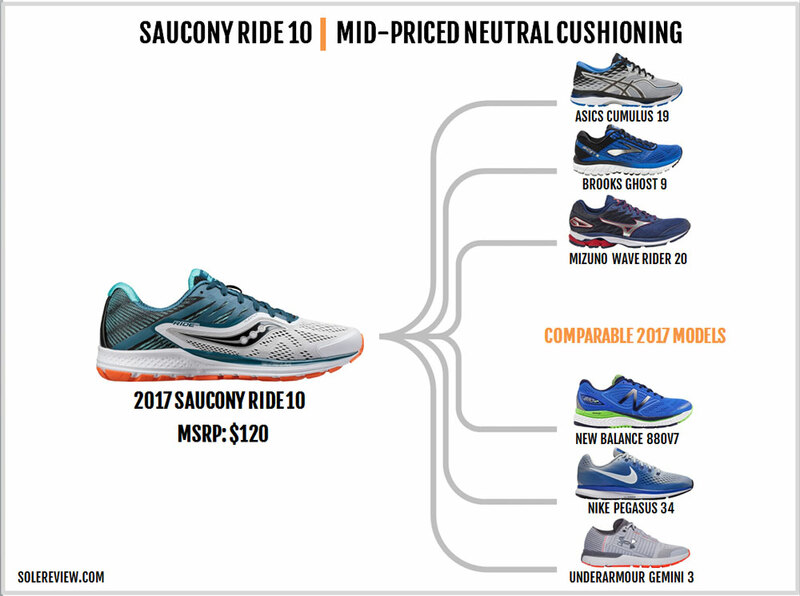 The Ride 10 represents a very competitive sub-category of running footwear, which happens to be the mid-priced neutral cushioning one. For most of the brands selling $100< shoes, this category is the most popular of all. Understandably, this segment is crammed with different models. Asics sells the Cumulus 19 at a similar price. It’s a simple shoe which delivers most of its cushioning through an EVA foam midsole, and the upper features the standard Asics design of mesh and synthetic. It is slightly softer than the Ride 10. The Brooks Ghost 9 is a supportive neutral trainer. It isn’t particularly responsive; it just delivers a foam-padded ride for a variety of run distances. The upper uses a premium material package, easily the best in class. Nike’s popular neutral trainer recently received an update. The changes on the Pegasus 34 aren’t earth shattering. The midsole gets to keep the dual heel and forefoot Zoom Air bags, which means the cushioned and responsive ride quality doesn’t change. What’s different, however, is a brand new engineered mesh upper. There are other contenders. The Mizuno Rider 20 is a firm and supportive daily trainer which is as neutral as they come, and the Underarmour Speedform Gemini 3 is a medium-soft and versatile neutral cushioning shoe. The New Balance 880V7 mixes the old and new; a soft engineered mesh upper is bonded to a dual-density midsole to result in a cushioned ride.